Located in the center of Xi'an City, the Xi'an City Wall (西安城墙) measures 12 meters high, 18 meters wide at the base and 15 meters wide at the top. It is 13.7 kilometers long and the length of the east, west, south and north walls are, respectively, 2590 meters, 2631.2 meters, 3441.6 meters and 3241 meters. It has four gates; Changle Gate in the east, Anding Gate in the west, Yongning Gate in the south and Anyuan Gate in the north. The existing wall was built between 1374 and 1378, making it over 600 years old. It is the oldest and most well preserved ancient city wall in all of China. There are 5948 battlements on the outward side of the city wall, once used by archers to defend against intruders. Every 120 meters, there are ramparts that extend off the main wall. About every 40 or 60 meters, there are water channels made of green bricks used for drainage. The channels were very important for long term protection of the wall. The Xi'an City Wall is a comprehensive defensive structure that includes a moat, suspension bridge, draw bridge and turrets. 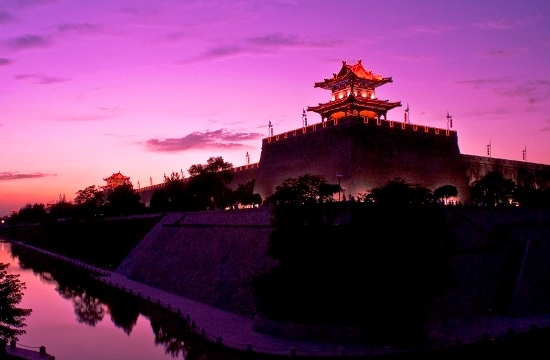 In 1961, the State Council announced that the Xi'an City Wall was included in the first batch of national important historical sites that received special preservation.